Bill Burnett, the Founder and Race Director of the Cohasset Triathlon was recognized with the Nancy Jones Diabetes Champion Award at the 2013 Juvenile Diabetes Research Foundation's 2013 Boston Gala. Past Champions include Dr. Doug Melton, who is leading the charge in stem cell research in search of a cure at Harvard, and the late Senator Edward Kennedy for the significant public policy impact he had for people living with diabetes. 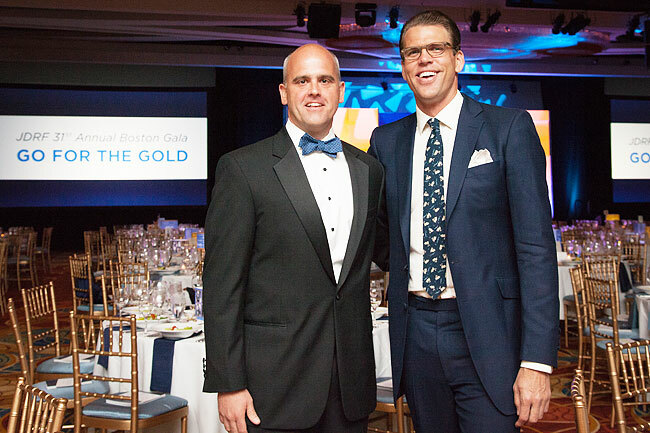 Bill Burnett with Olympic Swimmer Gary Hall Jr. The Cohasset Triathlon is the largest third party fundraiser for JDRF in the country that is the product of hard work and great generosity and dedication to the cause of improving the lives of people with Type 1 Diabetes and finding a cure. In addition to raising over $1.25 million for JDRF, Bill has innovatively built a model of success that the national JDRF organization hopes to replicate elsewhere. He has dramatically increased awareness of this disease and demystified it, showing that people afflicted by it fight and overcome challenges every day but live normal, productive lives. There's no better evidence of this than the "Tri Team for Diabetes", a growing group of older teens and adults with Type 1 Diabetes that compete in the Cohasset Triathlon every year. "It has been JDRF's great fortune that Bill's 'force of nature' approach to everything he attacks has been directed to our cause," stated JDRF Board member Sean Doherty, "this award is hopefully a token of that appreciation, and we're sure Bill accepts it on behalf of the volunteer work that so many of our old and new friends have done to make the event a success every year. With people like Bill on our side, all of the parents of Type 1 diabetics continue to have great hope that one day we'll realize a cure." Congratulations to Bill and all of the supporters of the Cohasset Triathlon.